Flexible rugged casing with a premium matte finish non-slip carbon fibre and brushed metal design, the Olixar Sentinel case in black keeps your Samsung Galaxy S9 protected from 360 degrees with the added bonus of a tempered glass screen protector. Case is strong, compact, not bulky and is very smart. Protective screen is excellent, fits perfectly and easy to instal. Shout louder about how good a deal it is! Case good screen protector didn't fit well. Does what it says, looks stylish and massively improves the grip of the phone. A lot of people don't realise I have a case on. Adhesive is only around the edges the adhesive is not great. The protector lifts in your pocket and you get dirt and dust trapped between the protector and the screen, I have had two of these now and had the same issue with both. Delivered on time. Product was better than my expectation. Good company to deal with. Won’t hesitate to use Mobile Fun for further purchases. 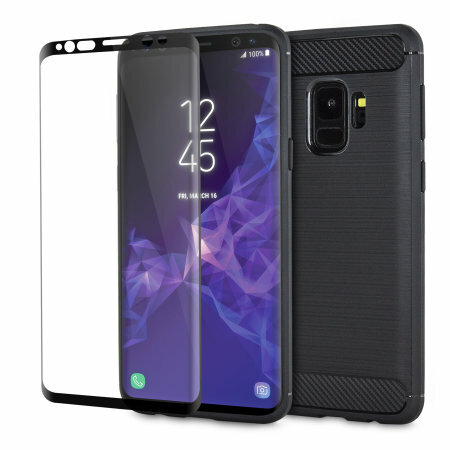 This product is sold as glass type screen cover for Samsung S9 AND appropriate case to fit with the screen. Don't believe it or it takes a magician to achieve the promise. With perfectly aligned screen protector the case touches the edge of the screen protector and results in the touch functionality being inaccurate and erratic. With the case off, the touch sensitivity and accuracy is improved but still disappointing. For best results with this screen protector, please ensure that 'Touch Sensitivity' is enabled. This will help a lot with this issue. Hope this helps. Ordered the product online - first delivery came with a cracked screen. I returned it with no quibbles and it a new one posted out. I added the 'protective screen to my phone and it didn't really fit snuggly and I had to press hard just get some movement. I dropped my phone once and the protective screen cracked in several places. Doesn't really do what it says on the tin. Sorry to hear you aren't happy with the screen protector, however it does sound like it took the impact from the drop, so hopefully protected your phone's screen in the process? the cover is decent but the screen protector is bad. it allows a lot of dust in between. The case itself it decent, and allows for good grip. However, the screen protector is not that great. Good combo, small case and screen protector. Nice small case, doesn't make the feel phone bulky, combined with the screen protector makes for a simple and effective way to cover the phone. Not ideal for moderate to heavy damage, not a full wrap around case. Only tiny issue is where the screen/protector rolls at the edges some of the touch sensitivity is lost, just had to adapt to that. The case fits well and isn't too bulky. The screen protector is good although doesn't wrap all the way round. Although it has curved edges, it isn't the whole width. I purposely bought this as the description read "with the added bonus of a tempered glass screen protector"
A misleading description as the glass screen protector appears to be plastic ? After 4 day's use it cracked from bottom to top and across the corner after a slight impact ! The front cover is also slightly smaller than the curved screen leaving a slight ridge before the back cover so swiping the edge is not as easy as without it. However, the back cover itself is good quality and snug fitting - if only the front was as good ! Please, can you contact your Customer Service team with images so they are able to activate your 2-year warranty.! My main concern was its robustness and how much it would add to the thickness of the phone for putting in my pocket. I have previously used cases with flip lids for protection and wanted to be sure this one would be as protective. So far it seems to be doing the job well. It is not too thick and feels well protected. One small problem emerging is that 'bits' (eg, dust, crumbs) get caught in the crack between the top clear sheet and the case the phone sits in. I'm not sure how big a nuisance this may turn out to be tho it hasn't really proved a big problem so far. it’s an okay screen protector. clear and clearly pretty rugged. however the edges are cut ‘just’ too short - they need to overlap the screen by an extra mm or two because where they finish impedes your ability to type or swipe from the edge. i’ve used them as a stop gap but they’re just a little too ‘narrow’. the case that comes with it is reasonably good and does the job. The screen protector is designed so that you can use other cases without them disturbing the screen protector itself. Please contact the Customer Service team, however, so they can look into what may be best for you.